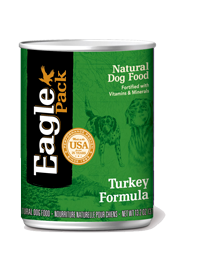 Eagle Pack® Turkey Canned Dog Formula is a complete and balanced diet for dogs of all life stages. Fortified with vitamins and minerals, Eagle Pack canned dog foods are ideal to feed as a complete meal or in addition to a dry diet. Turkey, Chicken Broth, Chicken, Chicken Liver, Ground Brown Rice, Flaxseed, Potassium Chloride, Carrageenan, Cassia Gum, Salt, Guar Gum, Minerals [Iron Amino Acid Chelate, Zinc Amino Acid Chelate, Cobalt Amino Acid Chelate, Copper Amino Acid Chelate, Manganese Amino Acid Chelate, Sodium Selenite, Potassium Iodide], Vitamins [Vitamin E Supplement, Thiamine Mononitrate, Biotin, Vitamin A Supplement, Vitamin B-12 Supplement, Vitamin D-3 Supplement, Riboflavin Supplement], Choline Chloride, Cranberry Powder, Yucca Schidigera Extract. Eagle Pack Turkey Formula Dog Food is formulated to meet the nutritional levels established by the Association of American Feed Control Officials (AAFCO) Dog Food Nutrient Profiles for all life stages including growth of large size dogs (70 lbs or more as an adult). Amount of food required depend on activity, age, environment, and breed. Feed at room temperature and refrigerate unused portion. Always provide access to clean, fresh water. Combination Feeding: For combination feeding, reduce dry amount by 1/3 cup for every 6 oz of wet food. Calorie Content: This food contains 1,390 kcal/kg or 524 kcal/can ME (metabolizable energy) on an as fed basis (calculated). AAFCO Statement: Eagle Pack Turkey Formula Dog Food is formulated to meet the nutritional levels established by the AAFCO Dog Food Nutrient Profiles for all life stages. Calorie Content: This food contains 1,390 kcal/kg or 466 kcal/can ME (metabolizable energy) on an as fed basis (calculated). Learn more about Large Breed Dogs and how to keep them healthy.